We know you have a choice where you take your vehicle for service and we appreciate your loyalty to The Taylor Automotive Group. In appreciation for your loyalty, we will reward you by giving you 5% back as loyalty dollars towards your next service, parts or genuine accessory purchase. By bringing your vehicle to us, you potentially earn enough to make a future service visit free! The Taylor Automotive Group Experience Plus Loyalty Card also makes a great gift. When purchased as a gift card, The Taylor Automotive Group Experience Plus Loyalty Card dollars do not expire. As a special thank-you for your business we will also load your card with 10% back as future vehicle purchase dollars. Ask on your next visit and we will register you for your new Taylor Automotive Group Experience Plus Loyalty Card. There are absolutely no fees to join. Each time you visit us for parts or service, simply provide the associate your card at time of payment. They will enter your Taylor Automotive Group Experience Plus Loyalty Card Program Dollars and they will be available for you to use on a future visit. You will also receive a confirmation of the loyalty dollars earned sent via your email. The associate will also enter your future vehicle purchase dollars and they will be available for you to use when you purchase your next vehicle. At the time of a future visit, simply let our associate know you would like to use some or all of your Taylor Automotive Group Experience Plus Loyalty Card Program Dollars1. Our staff will swipe your card and your Taylor Automotive Group Experience Plus Loyalty Card Program Dollars will be applied to the amount owing. It's really that easy! 5% is earned on regular priced service and parts. Promotional or discounted services are not eligible. Warranty or extended service contract repairs are not eligible. Commercial, Wholesale and Fleet accounts are not eligible for membership or redemption. If a Taylor Automotive Group Experience Plus Loyalty Card is not active for 18 months, the card will be flagged as inactive. The Taylor Automotive Group will communicate with the card holder to reactivate the card by earning or redeeming dollars in the next 180 days. Cards not active for 24 months will be cancelled and all accumulated dollars will expire. 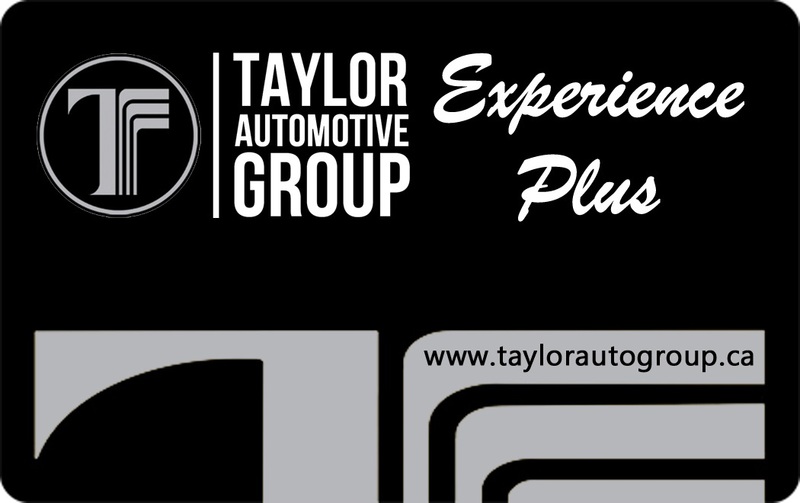 When purchased as a gift card, the Taylor Automotive Group Experience Plus Loyalty Card Program Dollars do not expire. Taylor Automotive Group Experience Plus Loyalty Card Program Dollars are not transferable and cannot be exchanged for cash.